One of the most informative and interesting classes that I attended at this year’s Utah Green Conference, was the Pollinator class given by Jim Cane of Utah State University. When most people think of bees, they think of the fairly recent immigrant to the United States – the European Honey Bee, brought over for it’s honey and wax. In Utah, there are around 900 species of native bees, the vast majority of which are solitary, rather than colony bees. The adult female makes her own nest, with no help. She will divide her tunnel into bee-sized cavities to lay individual eggs, and will most likely spend the winter in her underground home. Unlike social/colony bees, our native/solitary bees have little venom and little inclination to sting. And, while honey will not result from the labors of solitary bees, they provide valuable pollination for our trees, berries and other fruits. It is also really interesting to see all of the varieties of bees – from large bumblebees to the docile male Melissodes – which can be actually be petted! Since most solitary bee species nest underground, it is important to leave open soil in our gardens – heavy, continuous bark mulch or weed fabric can hamper the bee’s ability to find and make a home. Other natives will nest in the cavities of hollow cane plants such as raspberry and roses. Many solitary bee species are taxonomic specialists, focusing all of their foraging efforts on one type of flowering plant. 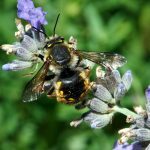 Plants to consider to encourage native bees to visit your garden are: Redbud, crabapple, plum and maple trees; Fernbush, Golden Currant and Rabbitbrush shrubs, Russian Sage, lavender, hyssop, goldenrod, globemallow, Sweet Vetch, penstemons, purple clover and buckwheat. In an effort to define standards for environmentally sustainable construction, the Leadership in Energy and Environmental Design (LEED) Green Building Rating System was developed by the U.S. Green Building Council in 1994. LEED was created to define “green building” by establishing a common standard of measurement and to raise consumer awareness of green building benefits. Points are awarded for meeting various criteria, with the ultimate goal of receiving a Certified, Silver, Gold or Platinum level of certification. The bottom line is to create a more sustainable built environment through site development, water efficiency, energy optimization, and use of reused and recycled products. The benefits of ‘going green’ are numerous and include the reduction and prevention of pollutants, conservation of natural resources and maximizing ecological function. While members of the “green industry” – landscape designers, architects, and builders, nurseries and growers, maintenance companies, tree care specialists, and pesticide applicators – are becoming more aware, it is ironic that this industry is often not ‘green’ at all in the sustainable sense. One hour of mowing equates to twenty miles in the car according to www.epa.gov , and mowers use 580 million gallons of gas each year. Over or misuse of pesticides and fertilizers upset a delicate ecosystem. Non-native plants can ‘escape’, becoming invasive and competing with the native landscape. Plants unsuitable for our environment put strains on our limited water supply. Composting – Plant material and kitchen wastes are broken down by microorganisms that give off carbon dioxide and heat, and can be added back into the soil as a rich amendment. Avoid using weeds that have gone to seed, diseased plants or those exposed to weed killers or systemic insecticides. Replace dead, dying, or too large plants with more drought tolerant choices that are appropriately sized for the space available to allow the plant to reach its optimal size. Change spray sprinkler heads which are only about 50% efficient to rotory stream or drip which are up to 85% efficient if installed properly. Add a Smart technology controller to your sprinkler system. These are generally under $200 and are programmable to reduce water consumption significantly. Diversity in plant material discourages diseases. If building a new home, make every effort to protect as much of the existing native landscape as possible. Dr. Phil Allen, Professor at BYU spoke recently at the Utah Nursery and Landscape Association’s annual Green Conference. His research has indicated that even with diligence, it can take from three to seven years or more for a native landscape to become re-established. At that same conference, Peter Lassig, designer of the gardens at Temple Square, talked about the predator/prey cycle, and noted that in a healthy garden, ‘bad’ bugs are kept in check. Encourage birds in your garden by providing plants with seeds and berries, water and places to hide. Birds are a natural pest control. Native plants maintain a sense of place, survive in our heavy, salty soil and provide habitats for native birds, insects and animals. Use of local materials reduces fuel consumption and vehicle use. Reduce night time lighting to retain our night sky. Use down lights instead of up lights and reduce wattage and quantity of lights. Use recycled materials as unique planters or garden art. Reuse lumber for building structures and try products such as ‘Trex’ type decking or lawn edging. Grow your own vegetables and herbs. Heirloom vegetables have less biological engineering and are generally tastier. As with any landscape, a garden that is intended to attain a level of sustainability should be well designed, attractive and functional. It should also be in balance with the local climate and require minimal resources to maintain. A 2005 study by the Families and Work Institute found that up to one-third of employees feel chronically overworked, and will not use all the paid vacation that they are entitled to. Many people said they would get too behind on the job if they took time off, while others cited not being able to afford to take a trip. Vacationing at home may be the answer. Economics aside, staying at home for a vacation can be enormously restorative and transformative and fits better into a lot of people’s schedules. Relaxing at home in the tranquility, comfort and security of their own backyard can be a great alternative to a traditional vacation, while still allowing people to experience what they often desire from their vacations. A landscape designed with a “Staycation” in mind has the added benefit of allowing you to Go Green. Lower noise levels, lower heating and cooling bills, and less money spent on traveling are added bonuses. Investing in exterior real estate improvement is still a solid long-term bet, and rivals the return on kitchen and bath remodels, while providing incredible personal return on investment by the homeowner who gets to enjoy it in the meantime. Upgrading or installing a new custom home landscape and choosing to remain in your home can be a prudent, as well as personally enjoyable alternative to selling in today’s market. In addition to your own backyard, the greater Ogden area provides wonderful adventure and vacation opportunity close to home. Charming and historical 25th Street has great shopping and dining opportunities. The Bear River Migratory Bird Refuge and Bear Lake are nearby. Take time to visit Timpanogos Cave, the Huntsville Trappist Monastery Abbey of Our Lady of the Holy Trinity, Antelope Island, Hill Field and its museum, the Bonneville Salt Flats, dozens of local ski resorts and nearby National and State Parks. Try mountain biking and hiking, ice skating, snow shoeing, cross country skiing. Watch semi-pro baseball or bike ride along the Ogden River. Visit the Ogden Convention and Visitor Bureau’s website at www.ogden.travel, to find local symphony, light opera, live theater and musicals, dance and ballet performances. There are new, innovative ways to think of vacation and staying close to home is one of them. On January 20th , 21st and 22nd of this year, the Utah Nursery and Landscape Association (UNLA) held its annual conference in Sandy. Among noteworthy topics at this year’s conference were organic gardening, natives in the landscape, medicinal herbs and ‘smart’ irrigation systems. Important speakers were Dr. Fred Montague from the Department of Biology at the University of Utah, and Eden’s own, Mel Bartholomew, inventor of Square Foot Gardening. Dr. Montague spoke on the role of home gardening and its positive impact on the environment in a time when 78,660,000 people are added annually to the Planet Earth and our resources are being depleted above sustainable levels. Montague noted that “feeding ourselves in a just and sustainable way (is) perhaps the single most important challenge of this century“. By growing our own food in a sustainable way, we eat healthier food, enhance the fertility of the soil, can produce next year’s seeds by using ‘heirloom’ plants, provide for other organisms such as earthworms, algae, spiders, insects birds, etc., and save the wilderness by growing food where people already live and have the resources to do so. Mel Bartholomew’s method of gardening uses considerably less space, water, and seed than traditional gardening practices, up to eighty percent less, while producing the same yield. It can be achieved in very little space, so it is ideal for residential areas. By starting with a weed free soil mix, his method is inheritantly pesticide and fertilizer free. Mel has always been an advocate of organic gardening. What both Mel Bartholomew and Fred Montague promote are sustainable gardening practices. In a broader sense, sustainability is the ability to achieve continuing economic prosperity while protecting natural systems. At the heart of sustainability is a goal to provide a high quality of life for people into the indefinite future. Achieving sustainable solutions calls for stewardship. With respect to ornamental landscaping, a sustainable landscape would be one that is capable of thriving with minimal long-term effect on the environment. Plants selected for their ability to flourish in our heavy clay, alkaline soil, and that require little investment in the use of time, labor, water, fertilizers, pesticides and imported soil, will tend to be sustainable. Sustainable landscapes will use the features of the site: boulders and rocks, retention of native vegetation, allow natural contours to remain, and maintain natural waterways. Our traditional landscapes produce wastes which most of us never consider: plant trimmings, polluted run-off from chemicals and fertilizers, and water lost by evaporation. By looking at site development, including landscaping, as an integral part of the local environment; and by using sustainable design principles, we can preserve and promote regional identity, culture, ecology, and create a sense of place. and is on the Education Committee for the Utah Nursery and Landscape Association. Over and over again, I hear people new to the area comment on how absolutely beautiful the Ogden Valley is. I have lived here for almost six years, and constantly have my breath taken away by the incredible beauty that surrounds us daily. How lucky are we to call this place home? Doubtless, old timers feel the same way. As the Valley swells with the sounds and sights of construction, how do we retain this natural and historical work of art so that we can all continue to enjoy this scenic splendor? How? By taking care. By taking care in our driving so that we allow wildlife as safe a passage as possible. Care to ensure that our pesticide, herbicide and waste practices do as little damage to the environment as possible. Go organic. Recycle. Drive gas efficient vehicles. Use our resources wisely. Minimize our outdoor lighting, so that we can all enjoy the desert night sky. Take care to balance our right to a view, with that of our neighbors. Care that the profile and placement of our homes allow the mountains and hills and native vegetation to dominate the ridgelines. Care that the exteriors of our houses blend in with the colors of the surrounding vegetation. Care that our plant choices mimic and complement the incredibly, subtle offerings of buff and tan, silver and gold, steel blues and dark greens, and autumn hues of golden oranges, rusts and sunshine that blanket our local hillsides. In a previous article, I had written about sustainability and a sense of place. Construction and development is progressing at a rapid, rapid pace here in Ogden Valley. The imperative to sustain this valley has reached a critical point. Maybe it is time to slow down enough to consider the impact of our development on this land. Can homes be better designed to blend into the landscape? Can homes be downsized to lessen their impact and to use less of our natural resources? Can architecture and landscape design reflect the rich heritage and natural beauty of Ogden Valley? At the bottom of the valley, here and there you can still find pioneer cabins squatting low to the ground. Fields of hay and alfalfa follow the lay of the land, with old farm houses surrounded by porches and lilacs, rambling roses and junipers, oversized vegetable gardens and giant, gnarled apple trees. Surrounding this verdant checkerboard are rolling hills of Big Tooth maple, chokecherry, juniper, hawthorn, silver sage, mules ear, and a myriad of beautiful grasses. Higher up we find Gambel Oak, Oregon Grape, scatterings of Mountain Mahogany, geranium and aster, in addition to the Big Tooth and sage. Higher still we find fir and aspen, Limber pine and spruce, serviceberry, snowberry, elderberry and thimbleberry, columbine and penstemon. If we can appreciate the unique beauty of each community of vegetation, we will take care to plant our gardens so that they compliment the elevation that they are in. To not try and create an alpine look in sage brush community, or an desert look in a riverfront community. A plant palette need not be entirely native to fit into its environment. Ornamental plants can be used that mimic the texture, feel, color and size of natives. Care can be taken to leave as much of the existing, native plants as undisturbed as practically possible. There are homes in the Valley whose owner’s do strive to have their homes blend into the native landscape. I have had the pleasure to work with some of these people. As you drive around, take the time to look. Notice which homes blend in, and why. These people care. I will venture to guess that most residents here will say that they care about the Valley, That they care about preserving the uniqueness that is Eden and Huntsville and Nordic Valley and Liberty. To really care, we must act. We all must do our part to ensure that we are leaving gentle marks upon the land. It starts with each one of us doing our part today and using our influence to shape the Ogden Valley of tomorrow. A recent trip to London and Paris with the Association of Professional Landscape Designers provided me with a unique opportunity to explore centuries old, traditional English gardens; the strong planterly forms and dramatic contrasts of light and shade in Anthony Paul’s Sculptural Garden ‘The Black and White Garden’; Julie Toll’s contemporary, natural style executed with wildflower meadows and flowering lawns; the subtle, watercolor gardens of Claude Monet; and the exciting gardens at Citroen Parc, where architecture and nature, French Baroque and modern geometry, urban and rural, collide to form incredible public spaces. Probably the most exciting gardens were the show gardens at Chateau de Chaumont in France, featuring thirty fantastic, surreal exhibits representing ‘Chaos – (Order and Disorder in the Garden)’, It was an incredibly stimulating and influential experience, with unconstrained designs full of adventure, imagination, interpretation and risk. Lectures by numerous international designers provided insight into the future of fine gardening and landscape design. Two distinct, universal trends emerged from the sharing of ideas with such disparate artists as Dan Pearson, designer of the romantic gardens of Torrecchia in Italy, new rooftop developments in Tokyo, and walled gardens in Yorkshire; Giles Clement, landscape architect behind many famous French gardens and France’s leading ecologist; and Tony Haywood, whose Conceptual Gardens utilize horticultural installations as fine art, and who encouraged us to think, dream, create, expand, push, reach and adventure. These trends seem particularly applicable to the severe environs of Northern Utah.Sustainability was a recurrent theme among the speakers, as well as being evident in many of the gardens we toured. Sustainable gardens are gardens where the designer is conscious of the landscape’s impact on the surrounding area. They utilize recycled materials, as well as renewable, local resources. In particular, sustainable gardens include plants that are appropriate to the climate and local growing conditions. This type of design encourages landscapes that leave a gentle mark on the environment. Designers in Germany are realizing the value of sustainable landscapes, and they are being installed frequently in the form of wildflower meadows, especially in urban and public settings. These gardens are virtually self-sustaining and maintenance free. Local wildflowers are chosen for their seasonal color and interest, and it has been found that familiarity is breeding acceptance of the meadow’s “down time” when seed heads dominate, and viewers are learning to appreciate the rites of passage and the return of spring. The second trend explored at the conference was the appreciation of a “sense of place”as a focus for creativity. The Ogden Valley is rich with design inspiration and symbolism in the form of our mountains, streams, rock formations, seasons, and wildlife, and an acknowledgement of the Valley’s farming heritage can be made through contemporary use of local and traditional materials and plants. An awareness of the human impact on the natural world is becoming increasingly important, and it is gratifying to see the international design community accept and embrace this reality by focusing on solutions through sustainability and sense of place. The lessons afforded by designers on the cutting edge of landscape design can, and should, be adapted to meet the particular challenges of landscaping in Northern Utah.